The first live blues concert recorded entirely in high-res DSD! Lifelike resolution sounds like front-row VIP concert seating! Blues Masters at the Crossroads. Produced by Acoustic Sounds, a global audience returns year-after-year to worship the blues at Blue Heaven Studios in Salina, Kansas. 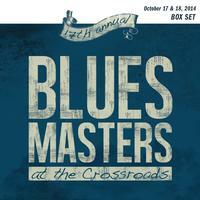 For the first time we're presenting six sets recorded live in 2014 at Blues Masters at the Crossroads Oct. 17-18. And it's the first live blues concert recorded entirely in Direct Stream Digital (DSD)! Here's the whole kettle of spicy musical gumbo, the world-class collection of all the sets recorded at the October 2014 Blues Masters at the Crossroads concert at Blue Heaven Studios. Chad Kassem, Acoustic Sounds' founder, head salesman, record producer, and a man obsessed with everything music, has for 17 years brought the best roots music — blues, Zydeco, swamp pop and old-style soul he fell in love with growing up in Lafayette, La. — to the middle of the country, Salina, Kansas. Now in your listening room you can hear sets by Rip Lee Pryor, Moreland & Arbuckle, Joe Beard+Lazy Lester, George Brock, Marquise Knox and his band, Sonny Green, and none-other than the soul-blues belter Mighty Sam McClain! From around the world, fans return to Blue Heaven Studios in Salina year-after-year for this historic event. Blues aficionados flock because the lineup each year boasts real-deal legends. Fans of the arts come for the unique setting, a 91-year-old sanctuary flanked by massive wooden timbers and soaring plaster arches. Audiophiles rave about the sound quality. The acoustics are such in our converted combination concert hall and recording studio that every detail and nuance can be heard perfectly with minimal reinforcement. This is music without peer: Blues mud and jam band rhythm; gospel and blues meets Memphis soul; sizzling harp; fresh, confident songwriting; powerful old-style soul, and more! First-class musicianship - a great horn section, intricate guitar work, soaring vocals. It's all here and it's all together for one price. If you've ever been to the Blues Masters show, these tracks will release fond memories. If you haven't, treat yourself to the live audience experience. And come visit us this October. We're excited to see you!